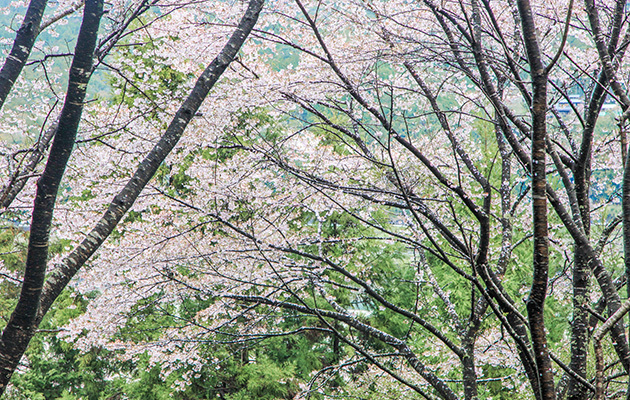 Pilgrimage route runs through Ancient forest. Overlooking Nachi falls at the end of the pilgrimage . 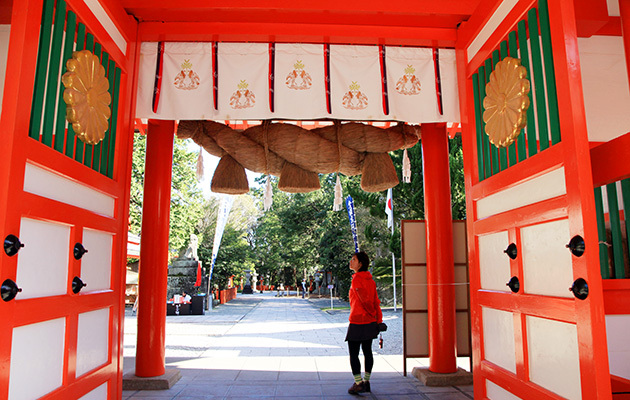 We visit the three Grand Shrines which are Kumano Hongu Taisha Shrine, Nachi Taisha Shrine and Hayatama Taisha Shrine. Rock garden in Koyasan, the center of Shingon Buddhism. 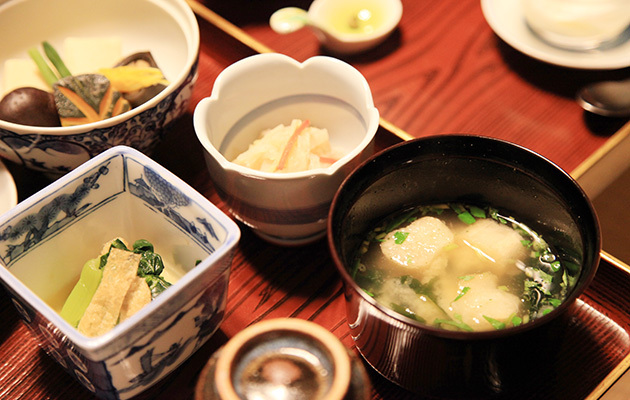 Kaiseki, a first class Japanese course meal, prepared by local chef. Yukata, a Japanese robe is provided at each Traditional Japanese inn, Ryokan. Outside Hotsprings to soak your feet after the hike. Your guide is fluent in both Japanese and English, ensure your trrip is enjoyable and hastle-free. Best time to enjoy cherry bloosoms . All transportation (Taxi, Bus, Train) as stated in the itinerary between destinations in Japan are included. Lookout point of the Paific Ocean, close to the end of the pilgrimage. The trip starts in Wakayama and finishes in Wakayama. The area is served by Osaka’s Kansai International Airport (KIX). Full-time services of Yamnuska tour leader/guide. 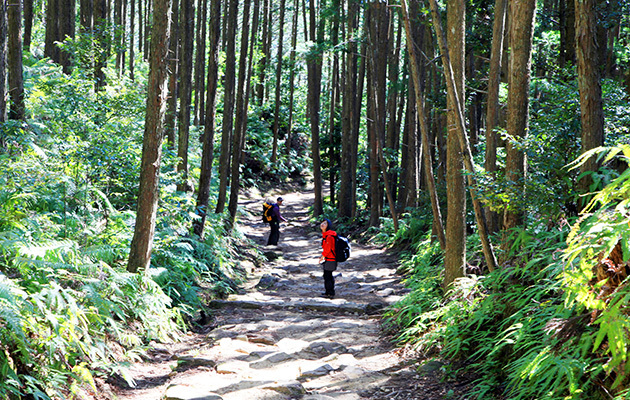 6-day Assistant guide service for Kumano Kodo pilgrimage. 10 nights’ accommodation (single supplement applies). 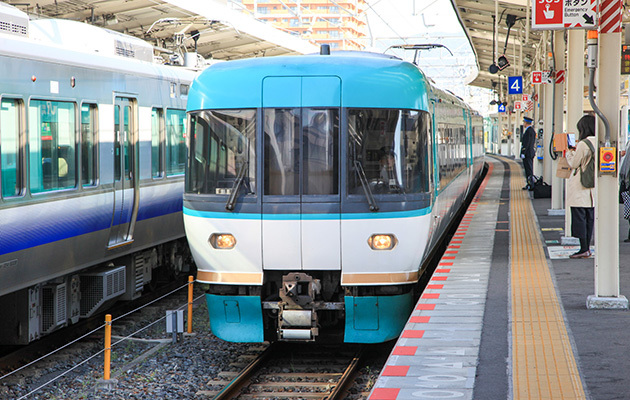 All transportation (Taxi, Bus, Train) as stated in the itinerary between destinations in Japan, except for transportations during a complimentary tour on Day 1. 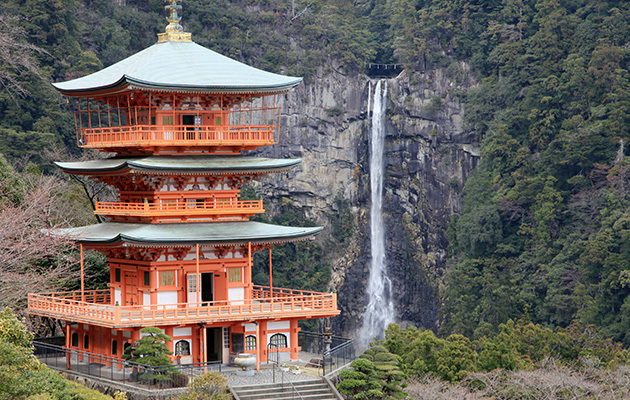 A private transportation from Wakayama to Koyasan on Day 2. A private transportation from Nishinaka to South Totsukawa village on Day 5. 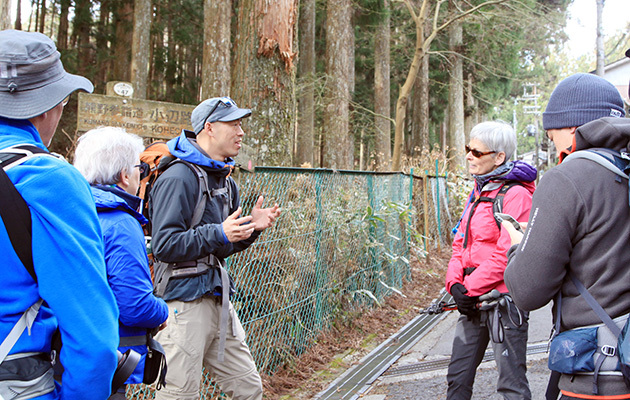 A private transportation from Nachi Taisha to Katuura on Day 9. A private return transportation between Katsuura, Hayatama Taisha shrine and Nachi Taisha shrine on Day 10. 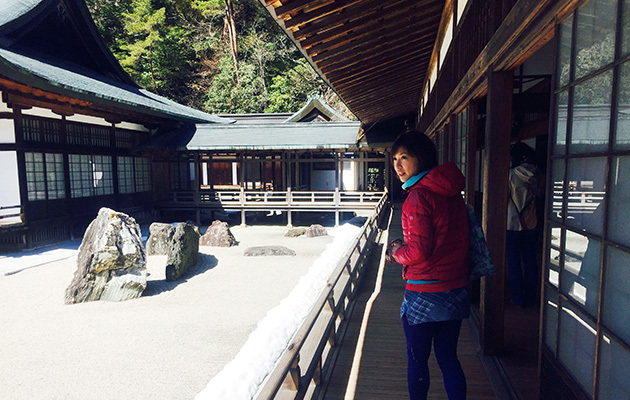 Half-day guided tour at Koyasan. Entrance fee to all sites and temple in Koyasan. Hot spring (onsen) entry fees. Flights to and from Wakayama/Osaka. If you would prefer a single room when available or you are a single traveller, you will be charged an extra single supplementary fee for certain nights. If you are a single traveller and are willing to share with another traveller of the same gender let us know and we will try to pair you up if possible. Payment of the Single Supplement Fee does not guarantee a single room booking when staying in accommodation on the night of Day 2 due to limited temple lodge availability. 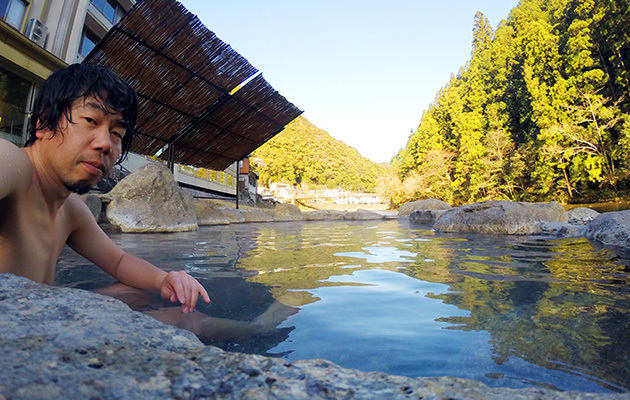 Single rooms are only guaranteed when we are staying in a hotel in Wakayama on Day 1 and, Omata on Day 3, Totsukawa Onsen on Day 5, Kumano Hongu on Day 6 and Day 7, Koguchi on Day 8, Katsuura on Day 9 and Wakayama on Day 10. No single rooms are available at Minsyuku on Day 4, where you will share a room with other group members of the same gender. In the event that a single room cannot be provided, Yamnuska Mountain Tours will refund the portion of the Single Supplement Fee relevant to that/those nights. It is a challenging hike which requires more than a moderate level of fitness and it is definitely not for a beginner hiker. The trail is not at all technical though there are some significant climbs encountered (see Day-by-Day itinerary) including 3 major passes over 1000 metres. You will need to be able to hike with the group for seven days, each averaging a comfortable 15 km, 800 m elevation gain/loss over 6 to 8 hours. You will carry a daypack with rain gear and extra clothing. Most of the trail is well-maintained and some days include small paved roads which are used by local residents. Often we hike on flagstones (including many steps) which may be slippery due to moss. The trail can also be slippery and muddy when wet. 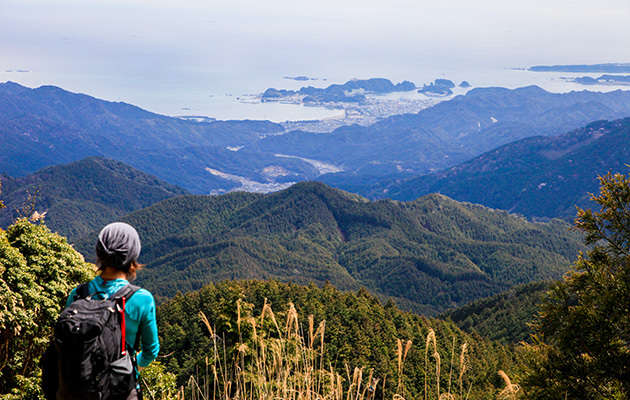 Hiking poles and hiking boots with good ankle support are strongly recommended. 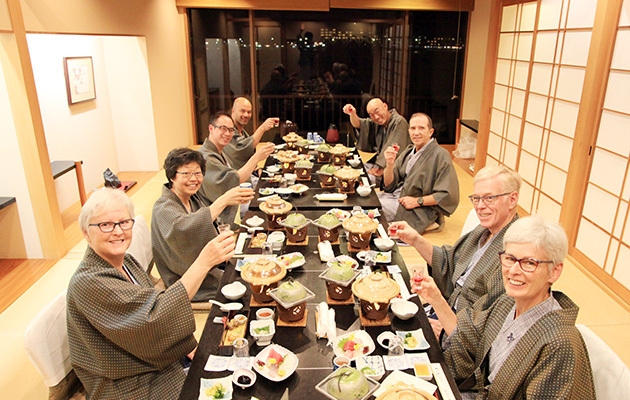 You will meet your Yamnuska tour leader at our hotel in Wakayama. There will be a tour briefing at 5pm after which we will have our welcome dinner in Wakayama. Upon booking you will receive an information package by email. It will include detailed instructions on how to get to our hotel from Osaka’s Kansai International Airport. If landing at another airport or arriving in Wakayama by rail or other means send us your travel details so we can send you customized instructions. You will need to bring your own daypack and personal clothing (guides carry first aid and emergency gear). Cotton clothing is NOT recommended as an insulating layer as it causes rapid heat loss when wet. Weather conditions can vary from hot to cold, rainy and even snowy meaning you need to be equipped appropriately. 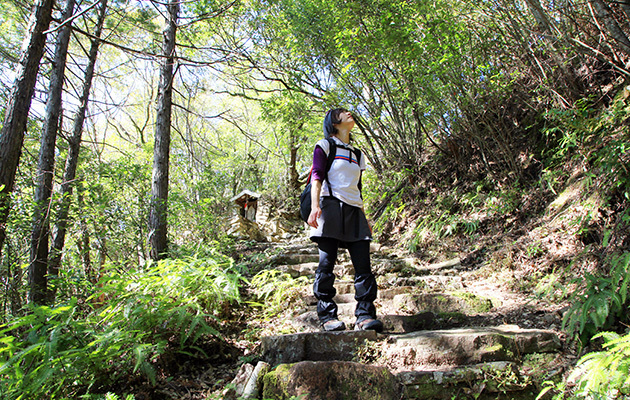 It also can be very slippery when wet, due to many tree roots, flagstone steps and muddy terrain. We highly recommend that you wear hiking boots which provide firm ankle support. Walking poles are strongly recommended. Your lunch during the hike are prepared and provided by the accommodations we stay in. Some days it is western style sandwiches, some days Japanese style ‘riceballs’ and typically, the portion of lunch in Japan is ‘small’. The accommodations do not provide trail snacks, protein bars, nutritional bars. It is important for you to have enough food for the day’s hike because some days you spend 7 to 8 hours on the trail. Sometimes these lunchs may not provide adequate nutrition or calories for the demands of the hike, so please bring your own trail bars, snacks from your home, e.g. cliff bars, granola bars, trail mix,protein bars etc.